Dallas – Whether it’s the technical details of shooting or the meticulous process of editing, Will Braden has always loved making films. He also loves cats. As creator of the Henri, le Chat Noir video series and curator of the original CatVideoFest, Braden continues to bring cat lovers around the world the opportunity to delight in watching more than a hundred professionally curated cat video clips in one showing. An added bonus: Nearly half the ticket proceeds of all of his shows go to local animal shelters. And, because of his love for animals and community, Dallas VideoFest Founder and Artistic Director Bart Weiss is teaming up once again with Braden to showcase PAWFest (Formerly CatFest) at The Texas Theatre in Oak Cliff Thursday night, August 23. This year dog videos are also included in the show, which starts at 7:00p.m. sharp. The doors open at 5:00 so you can come early to get to know some of the local animal welfare folks and check out the pets available for adoption. The original idea of doing a festival of cat films says Weiss, comes from Braden, who at the time was curating the CatVideoFest reel for the Walker Art Center in Minneapolis. “I’d heard about it for a few years, then it sort of struck me, why isn’t anybody bringing this to Dallas? I thought this would be a really great thing to do so we called the Walker, we asked for the touring package and to add a local component, we asked local filmmakers to contribute.” Weiss says. Weiss’s PAWFest, which is part of VideoFest, falls under the same video umbrella that all the festival events do, so in other words, cat videos have also evolved from video culture. But most media, Weiss says, is crafted in a different way. Braden took over the reigns of running the business side of CatVideoFest a couple of years ago when the Walker was ready to move on. CatVideoFest is a Social Purpose Corporation (SPC) says Braden, which translates to bringing great cat videos to the world and at the same time, raises money for local animal welfare organizations. Braden is also an award-winning filmmaker for his series, Henri, Le Chat Noir, which he started shooting in 2007. After completing Henri 2 Le Paw Leux in 2012, he got some attention from late film critic Roger Ebert when Ebert wrote on one of his social media channels that Henri 2 was the best Internet cat video ever made. Who is Henry? He is a beautiful 14-year-old tuxedo cat who was adopted by a member of Braden’s family from an animal shelter in Seattle. Henry is sort of retired now, says Braden. In 2012, people started coming out of the woodwork when Braden made a Facebook page for Henry’s character. Then the Henri video went viral really quickly. At right around the same time, the Walker was doing its first Internet cat video festival. When they made a call for submissions, Henri 2 was submitted over and over, and it got the Walker’s attention. Since it was clear to them that Braden had real talent, they reached out to him and asked if he would help with the festival reel. So he did and 2012’s CatVideoFest was a big success. He even won their top prize for Henri 2: the Golden Kitty award! Braden remained involved with CatVideoFest, putting the reels together for the next two years. In 2015, when the Walker decided to move on, Braden decided to step up and took the festival under his own wing, with a continued focus on raising money for cats in need. 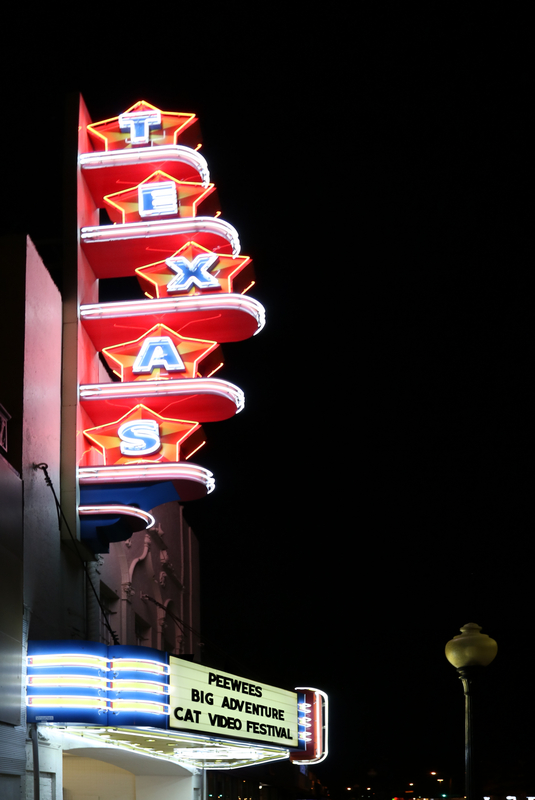 According to Dallas VideoFest Managing Director, Raquel Chapa, nearly 50% of the ticket proceeds are donated to Dallas shelters. This year, a portion of the proceeds will go to: MADE in Texas Assistance Dogs, The Spay Neuter Network, Cat Matchers and the Straydogs Inc. When the Dallas VideoFest team reached out to Braden and told him about their idea to do a dog and cat festival, he saw it as a great opportunity and immediately said yes. Each year Braden puts together a new reel of 100 to 110 clips. Careful attention is paid to how the clips are grouped together so that it creates an experience that is organized in a deliberate way. The finished product is a professionally curated and edited reel that will be watched and enjoyed by a ‘sea of cat lovers’, as Braden puts it. When the lights went down before the first video came up, people were making cat sounds all over the theater and Weiss realized what they had touched on, was exactly what they were trying to accomplish with VideoFest. That is particularly true since most people watch cat videos on their computer alone, and then they share them with someone else who watches them alone. And just so you know, Bart and his wife Susan live with and share their lives with four cats and one dog. Thursday, August 23, Doors: 5 p.m., Show: 7 p.m.